If you love watching TV in your bedroom after a long and tiresome day, then this four drawer media chest is the perfect piece for you. 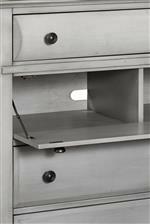 Not only do you receive those four spacious drawers for all of your media storage needs, the second from the top is a drop front drawer with cord access cutouts for hassle-free connectivity from your DVD player or cable box to your TV. 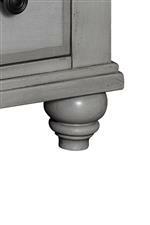 The piece is finished in an updated mineral gray for a unique touch on cottage design, while the classic turned feet and gently curved top drawer provide a touch of expert dimension and detail. 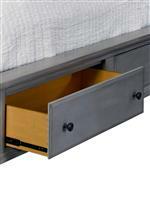 The Kearsley 4 Drawer Media Chest with Drop Front Drawer by Broyhill Furniture at AHFA in the area. Product availability may vary. Contact us for the most current availability on this product.